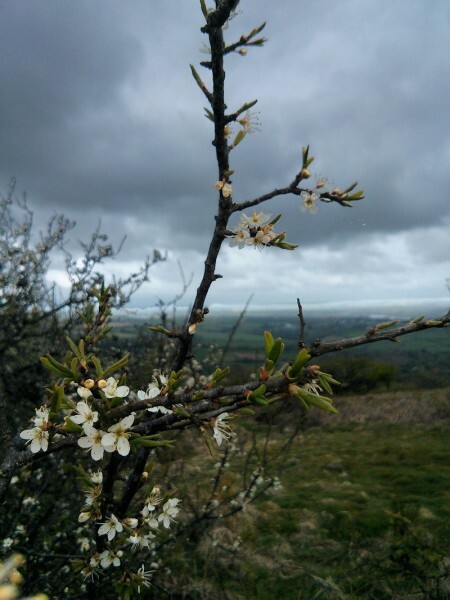 Despite appearances, I did not take this photo of blackthorn against a stormy sky in March. I took it this morning. There have been no mayflowers at all yet this year, and it needs to get a wiggle on, or they will be june-flowers. I was thinking that my big apple tree is going to have another fallow year this year, and requires a severe pruning - but observing the hawthorns and the lack of rowan-flowers, I may give it a bit longer before I do anything drastic. Admittedly, most of the apple trees inthe valley are flowering their hearts out, but this one could still be late, I think. Here in Essex everything is heavy with blossom - the thorns, apple, crabs, chestnuts and even the odd rose. The magnolias are over. No roses here yet and the magnolias are still out - but we are quite high up. They may have roses already down in the lowlands along the coast! Pretty picture, I love Blackthorn. Neither my Blackthorn or May have come out yet, my apple has lost all it's blossom thanks to the storm last night and the cherry is looking rather thin. Things are at least 3 weeks later than usual in the garden. Goodness, if your blackthorn is still not out, perhaps it has decided to stay in bed this year? My big cherry tree is looking very promising this year, but it's at the stage where its hard to tell how many of the incipient cherries will fall off before ripening. I am wondering that, I must take a closer look at it next time I'm in the garden to see if it even has any buds. The apple was laden with blossom this year, but it's still a very young tree so I'm not sure how many it can support. If it doesn't lose a lot in June drop I might have to nip some off myself to preserve the others. I'm hoping for a good cherry crop. It was terrible last year, but good the year before, so I'm holding out for a better year this year. I love cooking with Morellos!